The intellectual property (IP) of a business can be the most valuable assets it possesses. Nationally and globally, intellectual property rights protect the inventive and creative works of a business and encourage innovation and foster investment. IP also helps drive economic growth and competiveness and supports the growth of jobs. However, consistent and effective protection and enforcement of IP rights can be complex and challenging for new and veteran business owners. 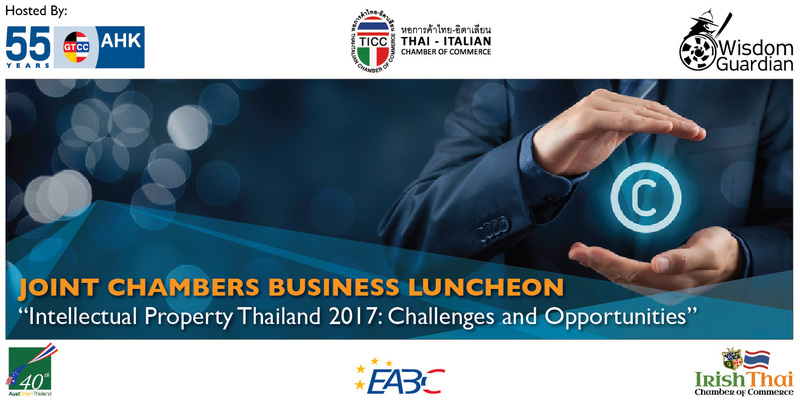 At the GTCC/TICC luncheon “Intellectual Property in Thailand 2017: Challenges and Opportunities,” our panel will discuss Thailand’s IP landscape and impart valuable knowledge on effective strategies for protecting your IP in Thailand, best practices and recommendations for IP owners, and the future of IP protection in Thailand. Our panel consists of Ms. Jittima Srithaporn, Director of the Intellectual Property Promotion and Development Office in the Department of Intellectual Property, Dr. Poondej Krairit, Director of Wisdom Guardian IP Consulting, the Head of the Intellectual Property Department at Dej-Udom & Associates and Mr. Simon-Thorsten Wiebusch, Country Group Head South East Asia – Crop Science of Bayer Thai Co., Ltd.
Mr. Simon-Thorsten Wiebusch, Country Group Head South East Asia – Crop Science of Bayer Thai Co., Ltd.